I just embossed the white card with a fabric folder-love the texture this gives. And white heat embossed the sentiment on black card and popped it up on foam pads. These wine glasses are cut from glitter card. This is fantastic and so very festive. Love the wonderful texture of your background and those sparkly glasses. 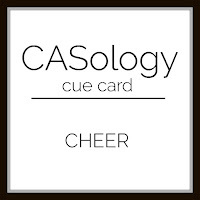 Thanks so much for playing along at CASology this week. So perfectly CAS. Love the silver and black together! This is a terrifically cute, fun card! 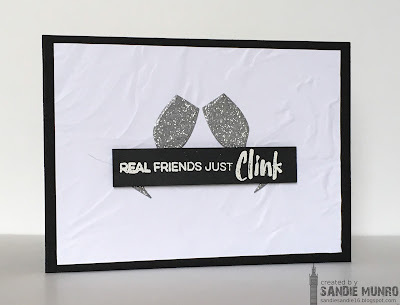 Love the touch of glitter, and that fun sentiment! Love this card, the glitter on the glasses make them very festive! Another beauty Sandie. Love the silver glasses. Beautiful card, Sandie. The glittery clinking glasses are a stand out. Love the punny sentiment. Thank you for joining us this week at Less is More. Absolutely and beautifully CAS, Sandie ! What a great crumpled background, it gives just a soft dimension for these glittery glasses ! And the sentiment is so great and so true ! 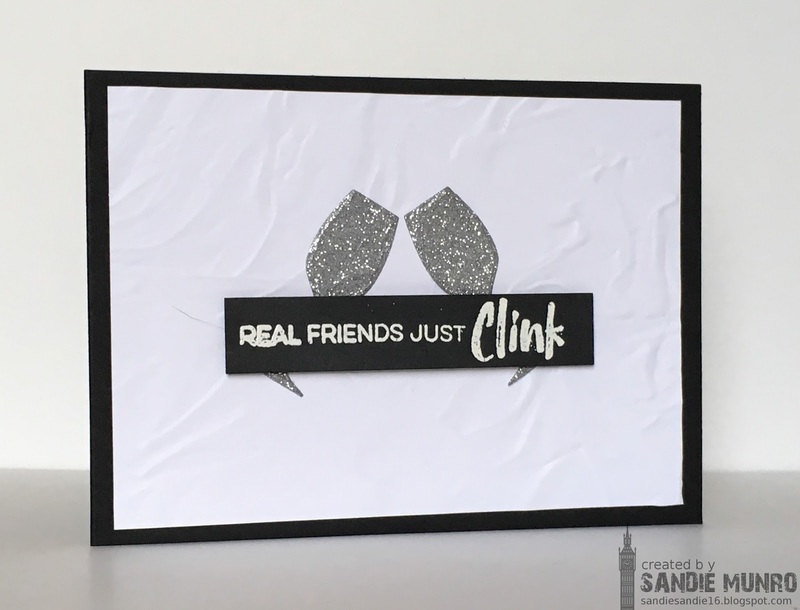 To stamp it on a black strip of paper gives this sophisticated look to the card ! Love it ! Thanks so much for sharing and for playing along at Less is More ! I just love those glittery glasses! Fantastic card! Thanks for playing along with CASology! fun CAS card, luv the glittery glasses! I am so glad you played along with us at simon says stamp wednesday challenge! That's a very cool textured background. LOVE the sparkly glasses!